Festive season is in full swing. Holiday parties, events, and catching up with friends - it is all fun and hectic at the same time. However, one this is for sure that Winter is here and sure to stick around for next four months. We had our first snow of the season this weekend, which melted the very next day but the cold was real. Thank god for stylish winter layers. 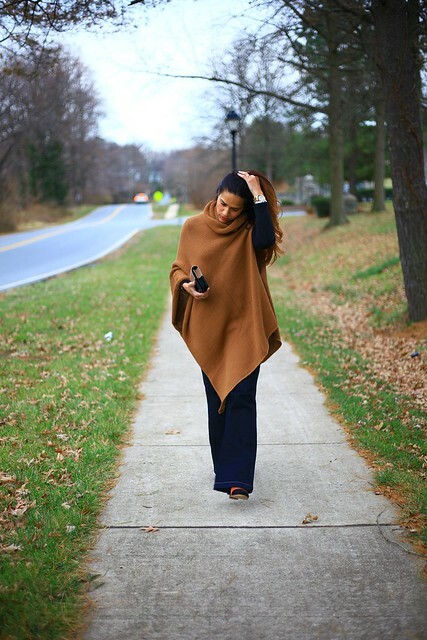 I have found my new obsession for the season - the Alpaca Asymmetrical Poncho from DeNada. It was love at first sight. I picked this piece from the racks, tired it on and didn't even try anything else after. It is hands down my favorite pieces from this season. It is handmade from a soft alpaca blend, featuring one armhole and a cowl neckline making it such a unique piece. I love the color, the cut, and how warm it is. I didn't think I was a 'poncho' girl, but if it is this stylish then why not! 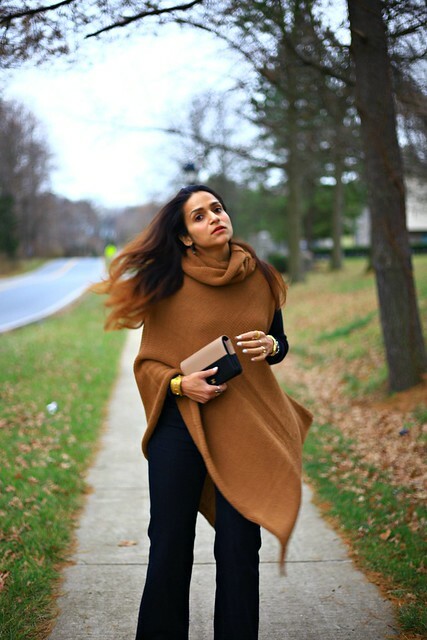 I picked this initially for the color as it instantly attracted me and after trying it on I found this piece to be equal parts edgy and elegant, not to mention perfect for cold-weather layering. Also, I like stepping out of my comfort zone every now and then. I styled it with the wide leg jeans, boots and gold accessories. I am definitely going to repeat this look again this season. P.S. Next I want to stock up on their beanies. That poncho looks so comfortable! 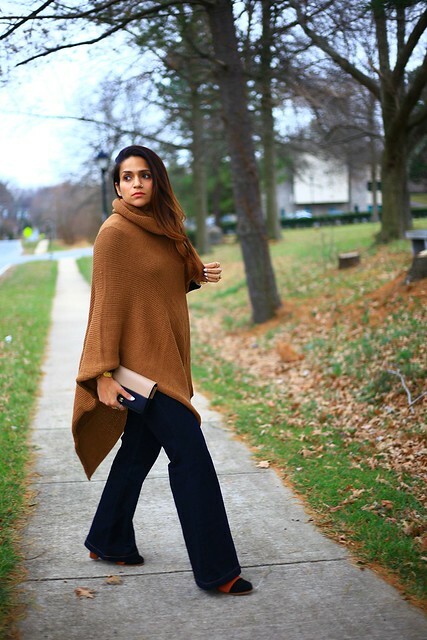 I love the slight flare leg on those pants! Such a pretty style! Love this look and the color combo is perfect! That poncho is so fab! Absolutely one of my favorite looks from you. And your hair is the perfect accessory to this poncho -- the colors complement each other so well. Looking gorgeous, T! I love this look! Ponchos are SO in right now! That poncho is gorgeous! Love how you paired with flared pants. 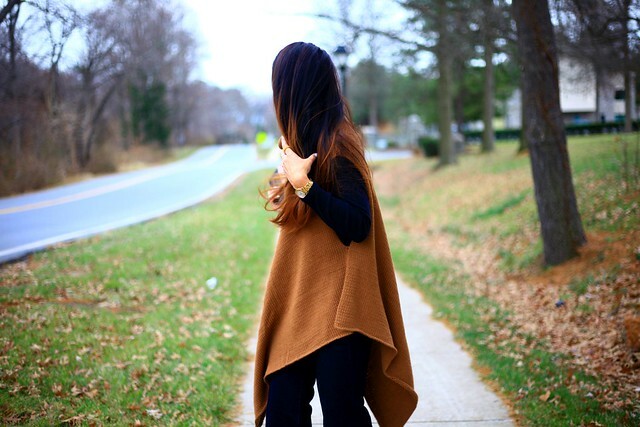 Love, love your poncho. DeNada makes beautiful pieces! 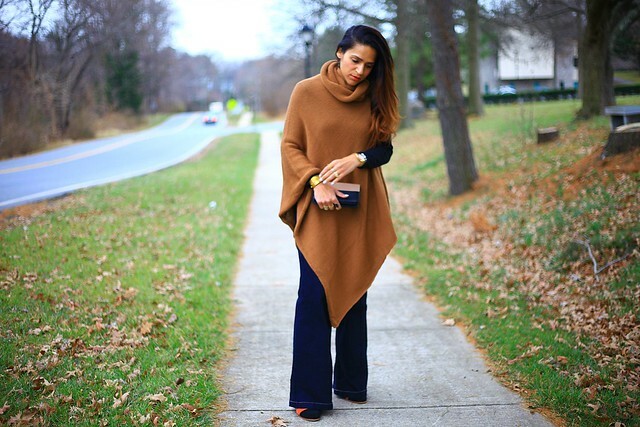 That poncho is perfect for winter! Looks so warm. Love your accessories too! So cute! Love that clutch!! I love ponchos this time of year! They are so cozy and hide that sheet of holiday cookies I am bound to eat. Your Chanel clutch is just darling! That poncho looks SO cozy! I love how you styled it! I need that poncho in my life like yesterday. Gorgeous!